ENGLAND won the Hong Kong Sevens for the first time in the competition’s 27-year history yesterday, Henry Paul taking centre stage as they defeated favourites Fiji 33-20, while in the plate final, Scotland were thrashed 48-7 by South Africa. Having overcome a spirited Welsh side in the semi-finals of the World Sevens Series event, England upset the odds with a five-try display that deprived Fiji of a record 11th Hong Kong title. James Simpson-Daniel, the England wing, scored a hat-trick of tries in the final, but it was rugby league convert Paul who was at the heart the team’s performances throughout the three-day tournament. New Zealand lead the World Sevens Series with 118 points. South Africa are second on 92 points, with Fiji third on 86 points. England’s victory in Hong Kong moved them into fourth place on 78 points. Scotland’s appearance against the Boks in the Plate final was something few would have predicted after defeat to Portugal on Friday, but they made it after beating the United States 14-10 in the semi-final. Peter Stringer, the Ireland scrum-half, has shrugged off the treatment he received at the hands of the Italians, claiming: "These things happen." Stringer came in for some special attention from Italy in a bruising Six Nations encounter at Lansdowne Road, which Ireland won 32-17. He was head-butted by prop Salvatore Perugini, elbowed and pushed to the ground by fly-half Diego Dominguez and flattened by Perugini’s fellow prop Giampiero de Carli during a 15-minute first-half spell. Despite nursing a bruised face after the match, the Munster and Ireland No 9 was in forgiving mood as he reflected on the punishment he took. "These things happen," he said. "We knew it would be tough from the start and they compete for a lot of ball in the rucks and sometimes it was difficult to get out of the way." Scotland Under-19s lost to France by 26-17 yesterday in their second match of the FIRA/IRB World Junior Championship at San Donna Di Paiva in northern Italy, and will now be playing for a finishing place between fifth and eighth. Peter Gallagher, the Scotland manager, said: "We played into a very strong wind in the first half and couldn’t cope with the conditions. But we played very well in the second half to score 17 points." 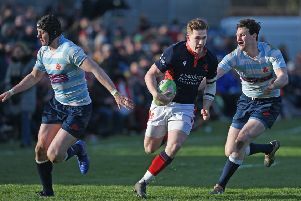 Scotland’s recovery produced three tries through Edinburgh Accies No 8 Dave Callam, Gala stand-off Andy McLean and Glasgow Hawks and wing Stephen Gordon. Sam Hendry, the Stewart’s-Melville full-back, kicked one conversion. Scotland’s women handed France the Six Nations title at Inverleith yesterday, going down 22-12. Scrum-half Paula Chalmers kicked all Scotland’s points with penalties.